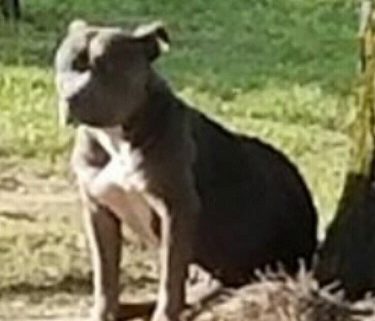 Once again, Breed Specific Legislation (BSL) has claimed the life of another pit bull. According to a recent study, more than 937 cities in the United States have Breed Specific Legislation in place. Statistically, pit bulls are the most often euthanized dogs in shelters. To think an abandoned, adult pit bull to be adopted and to live a happy life is a pipe dream that only few dogs will realize. Most of the abandoned pit bulls will be condemned to die from lethal injection or live a tragic life on the streets. In July 2006, the city of Clinton, Mississippi ordained, adopted, and approved an ordinance banning pit bulls and Rottweilers from their city. Debbie Fortner Toth, an animal rescuer knows all about Clinton’s ordinance pertaining to the breed and how quickly they euthanize these dogs. She set out to rescue a female bullie named Soul before Animal Control could get a hold of the dog. Soul had been seen around the area for a few weeks and was described by those who encountered her as scared and non-aggressive. She would dodge people at all costs and take refuge in the woods if someone tried to approach her. Debbie set up a trap on 10/22/18. Her intent was to trap Soul and take her to safety outside of Clinton, Mississippi. Unfortunately, Clinton Animal Control was also out to capture Soul. They were seen riding around the area where Soul was seen eating out of garbage cans and sleeping. 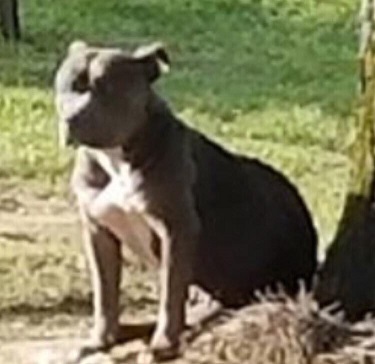 Local authorities in the area were advised to call Debbie or her friend Daphne if Soul was spotted so they could get to her before Animal Control did. There was also a potential owner who had lost a dog with Soul’s description. Debbie wanted to capture the dog and return her to her rightful owner. For weeks, Debbie watched Soul playing, sleeping, and looking for food. Then, one day Soul just vanished. Debbie looked for her, watched for her and waited. Someone advised Debbie that Soul had supposedly gotten into one of the field houses at the local high school and instead of Debbie or Daphne being called, Animal Control was notified. They would’ve taken Soul to the Mississippi Animal Rescue League (MARL) where she would’ve been automatically euthanized because of her breed. There are witnesses that say Clinton ACO picked Soul; there was even a photo taken by one of the witnesses showing Soul at the end of the Animal Control Officer’s catch pole. Debbie wanted answers on what happened to Soul, so she scheduled a meeting with Phil Fisher, the Mayor of Clinton, asking him to do an investigation. Two conflicting reports came in regarding Soul’s fate. MARL stated Clinton Animal Control had not brought in any pit bulls recently, nor were any logged in. The possible owner also visited MARL and was informed no pits had been brought in. An hour and a half after Debbie left Mayor Fischer’s office, his secretary called her back and stated the Chief of Police told the mayor’s office that Clinton Animal Control had picked up Soul and dropped her off at MARL. So, who is lying and who is telling the truth? According to Debbie Fortner Toth, when a animal is brought in by ACO, that animal is supposed to be on a five day stray hold to give the owners a chance to claim them. That does not happen at MARL. Debbie has stated. If everyone told the truth and if MARL had followed the five days stray hold rule, Soul might still be alive today and possibly back with her rightful owner. Debbie is angered that no one notified her about Soul being picked up and euthanized. The animal control officer has not returned any of her calls, nor any other calls regarding Soul, including her possible owner. Later, Debbie I found a dog dumped in a black bag that had the same colors as Soul. Was the dog killed before ever even going to MARL? Another dog killed just because of her breed? Hopefully the day will come when no dog is killed based on their appearance. Pit bulls were once loved by Americans until dog fighting became lucrative in the underworld. With the help of celebrities such as Cesar Milan, pit bulls are regaining their rightful place as pets. 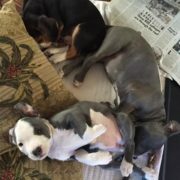 Attitudes are changing once again, and people are realizing that BSL is only adding to the problem of pet overpopulation. With enforcers, lawyers, and even the American Bar Association tiring of trying to litigate such confusing and specious laws, BSL may slowly be dying out. The following states all have laws that prohibit local governments from enacting breed-specific legislation or have statements saying that BSL may not hold up in court: California, Colorado, Florida, Illinois, Maine, Minnesota, New Jersey, New York, Oklahoma, Pennsylvania, Texas, Virginia, and Washington. Unfortunately, it will never bring Soul back nor any of the other Pit Bulls who were unlucky enough to be caught in cities where they are banned. Are they STUPID or JUST PLAIN INSANE! The BSL ignoramuses are TOO ICE COLD to grow HEARTS! We certainly know what the “BS” in “BSL” stands for! Soul was my dog. When I was notified of this baby, I IMMEDIATELY drove to the area at 11:00 pm, riding around for two hours, calling my baby, lookin for her. No luck. I drove to the area again a couple of days later when I was told she was spotted. I still didn’t get to see her. I worked closely with Debbie, keeping in touch, hoping my baby would be home soon. I was told that when she was able to catch this girl, I would be the FIRST person notified, so that I could identify her as being my sweet Soul. Clinton ACO took that opportunity from me. I will never have closure. I will forever wonder if this were my sweet girl who was senselessly MURDERED at the hands of the heartless monsters at MARL, who lied TO MY FACE when I went to the facility. After I had contacted them NUMEROUS times and provided them with a copy of photos of my sweet girl. She had two scars on her that would have made her very easy to identify. But, apparently no one bothered to look. Those vile pieces of garbage at MARL need to picture this: one of their HUMAN children goes missing, he/she is picked up by law enforcement and then MURDERED, without even the THOUGHT of contacting the parents who are DEVASTATED already, hoping and praying and missing their baby. Because that is what they did to me. I would never wish anything like that (dog or human) to happen to anyone, but Soul was my baby. She was a part of my family. And we will NEVER be the same without her. And I owe that to the evil individuals that call them selves a “rescue shelter.” What a joke. You of all people knew how hard I tried to save her. Many hours driving and sitting and fresh food for the trap to try and get her to safety. I was going to Immediately notify you. I can’t imagine the families pain knowing your baby was just down the road and awaiting to be reunited with a big piece of your heart, Soul. It makes it so much worse knowing that you were lied to and NEVER a chance to see her. Just as the article says, we were lied too and days later I found a pup in a garage bag on the side of the road in a dumping area that has her same color. I am so sorry this happened to you and Soul. My dogs are family, also. A few people in my family had Pitts and they were sweet as pie. I would love to have one when I am able to. I hope you get closure so you don’t have to wonder anymore. While I am not sure of the specifics or what would be involved; can you file a civil suit for reason being they cannot refuse to answer the questions. THOSE PEOPLE LIED THEN PUT THAT POOR DOG DOWN & NOOO TELLING HOW MANY OTHERS SHOULD ALLLL BE ARRESTED& NEVER BE ALLOWED 2 WORK R OWN ANY ANIMALS AT ALLLL ??? THAT STATE IS HORRIBLE& SHOULD BE ABANDONED FROM PEOPLE GOING 2 IT !!!! MISSISSIPPI GOODBYE & GOOD RIDDANCE ??? ?